I first tasted Piccadilly Carrot Souffle side dish at a Piccadilly Cafeteria in WPB, Florida several years ago and spent the next 6 months trying every recipe I could find that might be “it.” Then a lady posted it to a recipe list I was on, and EUREKA!! “it” was finally found. I have tweaked it a wee bit to make it less sweet than the original recipe. This is a perennial favorite, enjoyed by everyone, even kids who don’t like veggies. Piccadilly Cafeterias are well known in the United States Gulf Coast regions. They originally opened in the 1940s in Baton Rouge, Louisiana. They were always known for creating delicious home-cooked items. They are known for their good old-fashioned cooking. They serve up menu items like Chicken Parmigiana, fried chicken, homemade pies, and of course their well-known carrot souffle. What is a carrot souffle? You might think that whenever you hear the word souffle you may envision a chef hard to work preparing a dish that is difficult to make. So often a souffle means beating egg whites feverishly combining ingredients in an exact way that a slightly failure means the dish will turn into a flop. But, not with a carrot souffle!! A carrot souffle is basically as simple as cooking carrots until tender, blending them with eggs, sugar, and butter, and popping this into the oven. Really, it’s that easy. 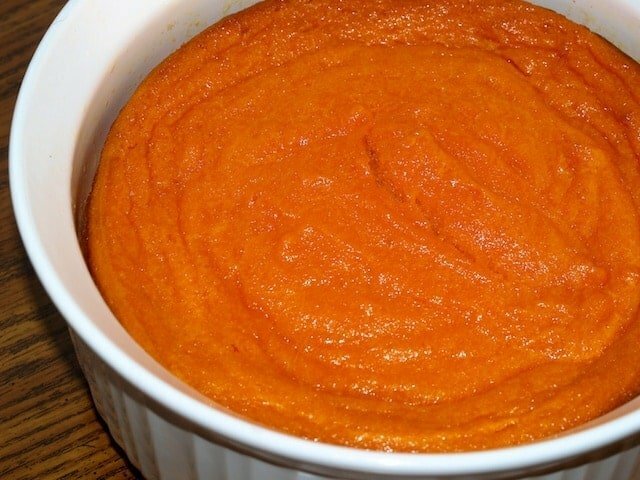 You aren’t going to need any exotic ingredients for your carrot souffle, you are going to need only carrots, sugar, lots of eggs, and butter. I often buy baby cut carrots because they are easy to use, for this recipe I like to buy a large bag of carrots, and it is ok if the carrots are HUGE. In fact, that far less expensive bag of carrots is going to taste sweeter in this recipe. The larger the carrot means the sweeter they can be. So grab that inexpensive bag of carrots and whip out that vegetable peeler. Cooking the carrots until they are tender is the real key to this recipe. Once the carrots are cooked until they are fork tender, that is when we are going to combine them with the remaining ingredients. You can cook the carrots in two ways, you can steam them on the stovetop, or in your Instant Pot, or you can simply boil them. I prefer to steam them, but other ways work well. Whenever this is carrot souffle is served the dish never comes back unless it is empty. People always wonder what is in this recipe. It is super simple to make, and even those who hate vegetables love this dish. I often make this recipe for holiday meals like Easter, Christmas, and even Thanksgiving. I also bring it to potluck dinners. This Piccadilly Cafeteria Carrot Souffle also reheats fairly well, so you can make this one ahead of time and reheat it later. Thanks to Pegger for sharing this recipe. You can make the best Piccadilly carrot Souffle imaginable. Cook the carrots until tender; drain and mash. In large mixing bowl, combine mashed carrots, sugar, baking powder, vanilla and flour. Beat for 3 minutes. Add eggs, one at a time, beating well after each addition. Continue to beat, slowly adding melted butter. Pour mixture into a greased 1-1/2 quart baking dish or 9" square pan. Bake at 325F about an hour, or until set in the centre. Note: if your oven runs hot, reduce the temperature a bit to avoid scorching the bottom. To serve,lightly dust the top with powdered sugar. How about a crockpot version of the recipe? How do you cook the carrots? Are you boiling them? Is there another way to do it so you don’t boil out the nutrients? I am guessing you could steam them as well. Using Stevia and no butter and it came out great for me since I am trying to lose weight and needed more veggies in my life. What would halving the recipe look like baking wise? Still a whole hour? Great recipe. I started making it years ago for the holidays and I’m not allowed to stop. Thank you for this ,,,, we have had the picadilly carrot souffle for over 30 years at Thanksgiving & Christmas. This is the first year that they are no longer in Texas so,,, I was elated to find your recipe! ! Gonna surprise the family & make it myself, I pray it’s 1/2 as good as the original! I’m going to try this because I just loved it at Piccadilly. You know the first time I heard about this dish, I wasn’t thinking it was too impressive until I tried it. Very good stuff! Thank you; thank you! I love this dish in my local Piccadilly Restaurant. I only buy it during the holidays because it is expensive. I will try this recipe for sure! It is fairly inexpensive to make 😉 so you can have it anytime.